In the heat of summer, one’s natural inclination is to find shade, water, or an air conditioned space. What fun are two of those three options? 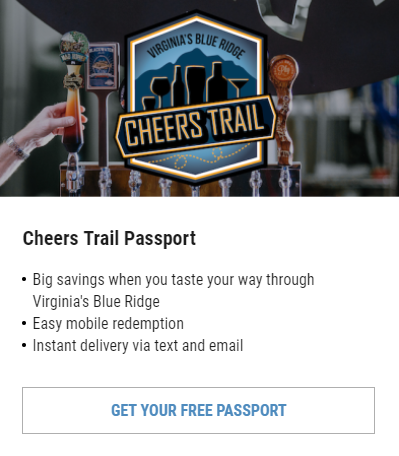 Let’s go the “just add water” route and have a blast this summer in Virginia’s Blue Ridge! Here are seven fun water adventures you can have with the family during your getaway to the Blue Ridge Mountains. 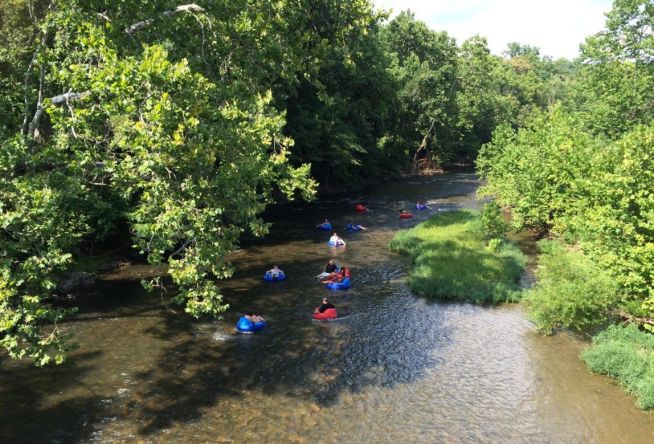 Dip your toes in the water, go for a swim, paddle downstream, or fish for a while on the Roanoke River. Access points are abundant, as the 45-mile Blueway serves as a water trail to connect smaller streams, parks, towns, and cities for a robust recreational opportunity. If you don’t know where to start with river adventures, go to an outfitter. 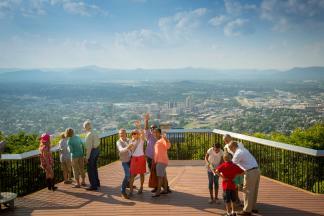 Kayaking, paddleboarding, and tubing are all in Roanoke Mountain Adventures’ wheelhouse. Each are rentable by the half day, full day or multiple days, and they include the required accessories. Shuttles are available to put you in the Roanoke River and pack you back out. If you’re apprehensive about going it alone or if it’s your first time, guided kayak and paddleboard trips will help you get your feet wet. In Buchanan, Twin River Outfitters is the premier resource for those interested in paddling the Upper James River, as well as the Cowpasture, Jackson, and Maury Rivers. Standard rentals, shuttles, and guided excursions are available, but a canoe camping trip is something above and beyond for families that really want to live it up during their #BlueRidgeDay. From one night to four, there are quite a few options to create your perfect adventure. 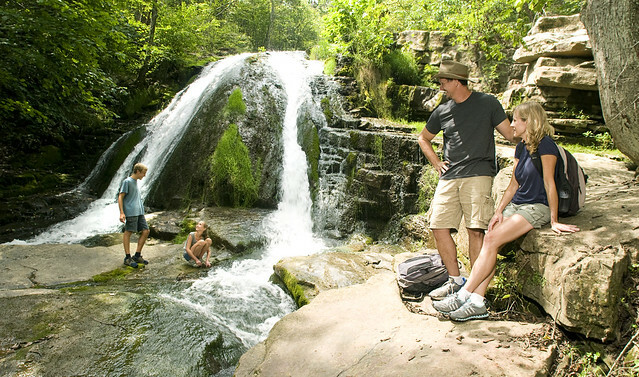 Virginia’s Blue Ridge is fortunate to have three Virginia State Parks to choose from when it comes to aquatic family fun, and all three offer boating, fishing, swimming, camping, and cabins. Learn more about Smith Mountain Lake State Park in Moneta, Claytor Lake in Dublin, and Fairy Stone in Stuart. Mark one off the list and move on to the next. After a day of sunning and swimming at Smith Mountain Lake State Park, board the Virginia Dare for a two-hour dinner and sightseeing cruise on Smith Mountain Lake. Relax, the kids menu includes those basic must-haves: chicken fingers and macaroni and cheese. Score! If you have little ones aboard, this cruise may be the thing they need to lull them to sleep. Expect to disembark around 9:30 p.m.
Set out on a hiking adventure in search of waterfalls! They do exist (along with swimming holes) in Virginia’s Blue Ridge, you just need to know where to look. Set out for Roaring Run in Eagle Rock, an easy trail that includes bridges, a 19th century iron furnace, and additional streams for plenty of exploring and photo opportunities. Pack a picnic lunch and bring a fishing pole (and your Virginia Trout license) to see what’s biting. The 69-foot Cascade Falls in Pembroke is a summertime hot spot that’s easy for the kids and pets. Take extra care when swimming and walking around the slippery rocks. The fall itself is a beauty and selfies are encouraged. Sometimes all you need is a place to unwind and maybe chill out from the “adventure” of child rearing. True for you? Then come cool your heels at Splash Valley. Let the current drift you away (or read a book) while another responsible adult watches the kiddos conquer the slides and splash around. From one mom to another, you’re welcome. Still seeking options? See what you can find in our list of the Top 10 Ways to Explore Virginia’s Blue Ridge Mountains and don&apos;t forget to subscribe to our e-newsletter.